Perhaps it’s the catchy lyrics behind the Village People’s famous single, but whenever we hear the word “YMCA”, we think of a place for everyone; somewhere you can go to participate in various activities and find a sense of community. Yet it only comes alive when the people who make up the YMCA embody that belief. Enter Corri Lewellen and Audrey Pickett: two women who are taking that sentiment and making it a reality. They are the spirit of the YMCA’s mission as this trainer and member work together to make the Hannibal YMCA in Missouri more accessible to its community. When you hear Corri and Audrey together, they sound like they’ve known each other for years. The chemistry flows through the speakers as they laugh and feed off of each other’s words. Yet these two women only recently met, and even then through a mishap that opened Corri’s eyes in a way that changed her perspective, and is now changing the YMCA. 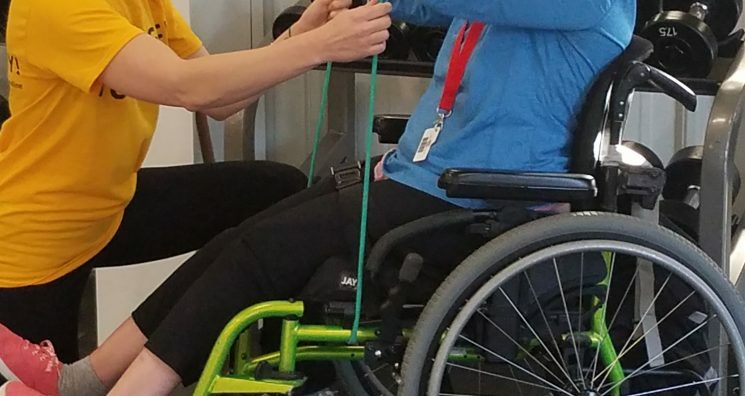 Corri, the Hannibal YMCA’s Group Fitness & Aquatics Coordinator, had scheduled for a Pound Fit demo to take place one evening that was designed to accommodate individuals with physical disabilities. The class uses lightweight drumsticks to create an exhilarating aerobic exercise class that helps tone the body and builds strength. However, she realized the moment she walked into an empty room that something was amiss. Originally, she had placed the class on the second floor, which was accessible only by the stairwell. As she trotted downstairs to identify the problem, she saw Audrey in her wheelchair. “It was an ‘oh crap’ moment,” Corri said. “I realized how limited my thinking was that I stuck this class upstairs.” Corri’s mistake opened her eyes so she could begin seeing the accessibility needs of the disabled community. They swiftly set up the class in a room everyone could access and the Pound Fit demo was a hit. As Corri invited participants to let her know if they wanted to continue it on a regular basis, Audrey quickly voiced her interest. 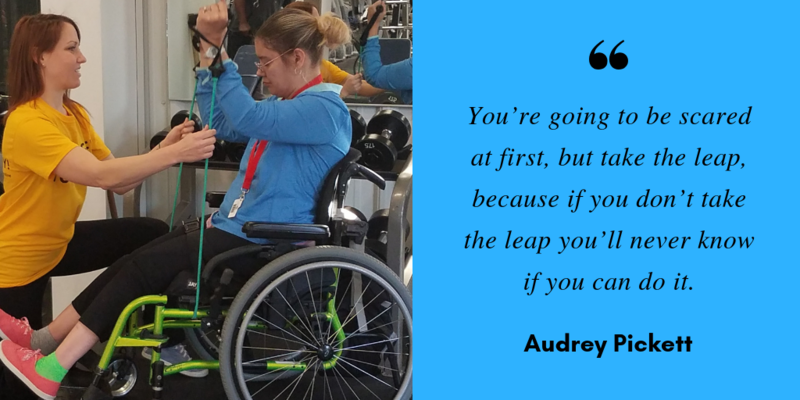 “It wasn’t until I met Audrey that I realized how many limitations were at our facility,” Corri said. “I wanted to be able to erase those but I wasn’t sure how to go about doing that.” Corri connected with Audrey, eager to understand her needs and what they could do to adapt to meet them. Together, they made it a point to explore not only how to make one class accommodate Audrey’s limitations, but the Hannibal YMCA’s offerings as a whole. During this process, it became apparent to Corri how much of the facility really wasn’t very accessible. It would be a big undertaking, and the YMCA would need help to make it happen. So she took to Google and researched what organizations were out there. Out of more than 80 emails Corri sent out, Dreamscape Foundation was the one to answer the call. “I was blown away by the support,” Corri said. “I sent out a lot of emails. It was the equivalent of a cold call, really. When Joe emailed me back, his words were so encouraging. ‘Yes, we can help you. I love your ideas. I have some of my own. When can we talk?’” Together they discussed ideas on how to not only help Audrey experience more of what the YMCA has to offer, but also to fund the equipment they would need in order to make their facility and workout equipment accessible. “I want everyone to feel empowered, that’s always the goal for our members,” Corri said. “I don’t want Audrey or anyone to come in here, look around, and go, ‘Okay, well, what can I do?’ No matter your physical disability, no matter your demographic, your age, your religion, we’re all people. 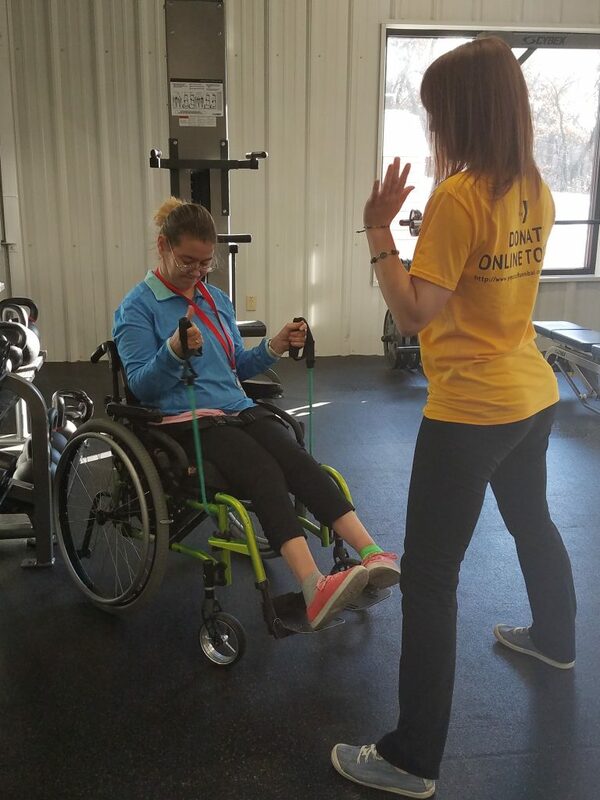 I’m just really excited to make our health clubs accessible and our fitness accessible and adaptable to everybody.” Together, Dreamscape Foundation, Corri, Audrey, and other members of the Hannibal YMCA staff intend to work together to execute campaigns to raise funds and awareness regarding the accessibility challenges within their community, starting with their own facility. Yet it won’t stop there. As Audrey and Corri bring awareness to the everyday challenges of individuals with physical limitations, they hope to be a voice and a force for change. Way to go Audrey Pickett! Keep up the good work.